TULSA, Okla. — CJ Massinburg and Nick Perkins stepped to the risers, and both wore long faces as they prepared to answer questions about the University at Buffalo men’s basketball team’s most lopsided loss this season. The Bulls weren’t supposed to be in this spot. Their intentions were to board a plane bound Sunday night for southern California, where they would have realized their goal of reaching the Sweet 16 and the second weekend of the NCAA Tournament. Instead, the Bulls return east. The season is over, after a 78-58 loss to third-seeded Texas Tech in a second-round NCAA Tournament game Sunday at BOK Center. They simply got smothered on the boards, got outpaced in transition and got outmuscled by a bigger and more athletic team. The Bulls finished with a season-low 58 points, despite having three scorers in double figures, and finished 19 for 52 shooting (36.5 percent), which included an uncharacteristic 3-for-10 start to the game. It’s only the fourth time this season the Bulls have shot less than 40 percent from the field. It’s a startling statistic, coming from a team that entered the game with the Mid-American Conference’s top scoring offense (85.1 points per game) and one of the nation’s top 10 scoring offenses. “It was an awful start,” said Oats, whose team trailed 19-6 in the first nine minutes. “We gave up three o-boards right away in the first couple minutes. It's not how you want to start a game. At times, we cleaned it up for a minute, but then, that, and our turnovers. You know, we had to clean the turnovers up. The loss to Texas Tech ended the most successful season in program history for the Bulls (32-4), and ended UB's 13-game winning streak. Texas Tech (28-6) will face second-seeded Michigan in a Sweet 16 game Thursday at the Honda Center in Anaheim, Calif. The Bulls took their only lead -- at 25-24 -- with 3:24 left in the first half, but Texas Tech took it right back. Tariq Owens (10 points) answered Davonta Jordan’s go-ahead 3-pointer 24 seconds later with a layup in the paint, and a 9-0 run helped Texas Tech take a 33-25 lead at the half. “The end of the first half was big,” Red Raiders coach Chris Beard said. “We talk to our guys all the time about 10, four-minute games. No one of those is more important than the rest. Those of us in sport, we always talk about the last four minutes of the game, but what about the other ones where you had a chance to win or lose the game? The Red Raiders didn’t allow the Bulls any room to complete a successful shot in the opening minutes of the second half. Then, the Red Raiders opened their lead to as many as 29 points in the second half. 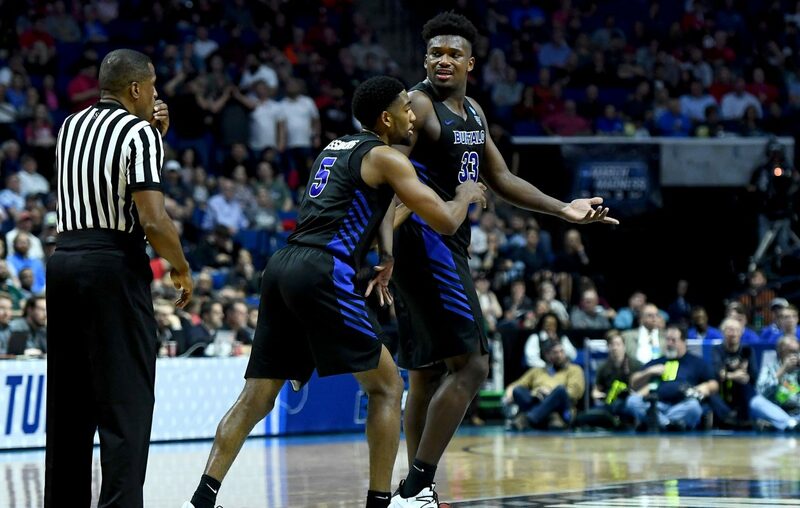 Massinburg and Perkins, two of five seniors who will graduate after this season, also had to come to grips with the fact that they won't play another game for the Bulls -- and how their final season at UB ended. "The emotions are kind of all over the place, you know," Massinburg said. "You know, you hate to go out like that, but when one team gets to end their season with a win, you know .... I mean, I just want to thank the City of Buffalo for allowing me to come in and just have an impact on you guys. And you guys have embraced me and loved me, and I loved you guys right back and just with Nick and Coach Oats and all of the assistants been amazing. I just want to thank Buffalo." Added Perkins, "It's kind of all over. Kind of thinking about some of the things you could have did better. I mean, it hurts." Oats, however, wasn't going to let one loss -- one of four in a record-setting season -- define the year. "Even when people ask me at the beginning of the year what my expectations were, I didn't want to go Final Four, Sweet 16," Oats said. "I just want to be playing our best basketball. "I thought we were playing pretty good basketball coming into this game. Sure, it's sports. It's what happens in basketball. You have a bad game. That's why the NBA playoffs are a series, not a one-game deal, so the best team can win. College basketball, it's a one-game deal. I'm not saying we're better than them, but sometimes the best team doesn't win sometimes. I thought if we played them in a series, we could play them a lot tougher than we did tonight. I don't want our guys to feel like it's a huge disappointing year." As Oats addressed the media from the postgame podium, Massinburg and Perkins studied the final scoresheet. Massinburg rested his chin on his left hand, and Perkins winced as he absorbed the final numbers. By the time they finished talking, however, they started to smile. Back in the locker room, nearly emptied, save for some half-packed bags scattered on the floor and student managers taking down March Madness-branded placards, Perkins provided some perspective. It wasn't not so much on the way the season ended, but also on how this season — and not just the sudden stop at the end — will help UB’s future. “I wouldn’t call this a disappointment,” Perkins said. “It’s definitely a little upsetting, not being able to get to that second week, but, you know, everything happens for a reason. I don’t know why shots didn’t fall tonight, or why things have to be or didn’t go our way tonight. But that’s just life. You’re going to have to deal with it.